This magnolia design garden border lawn edging will implement a splendid ornamental finish to lawn border edges and flower beds, patios areas and pathways. This metal lawn edging is powder coated to give a smooth and durable weather proof finish. Manufactured from heavy duty steel. 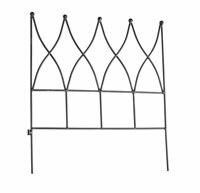 This garden border edge has a decorative shaped design. This garden border lawn edging will implement a splendid ornamental finish to lawn border edges and flower beds, patios areas and pathways. This metal lawn edging is powder coated to give a smooth and durable weather proof finish. Manufactured from heavy duty steel. This garden border edge has a decorative floral design. 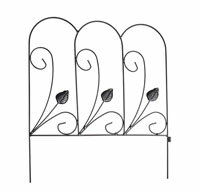 We have matching garden trellis in the same design in both Tulip & Magnolia designs. Please click on the image to view matching trellis.